I owe a big debt to a senior product manager at a meeting I attended earlier this week. When the presentation about search engine optimization techniques turned to my role in creating a corporate blog, I got a good look at her expression. It started with incredulous and progressed to annoyed. Her face told me that “blogging” is something she associates with an 18-year-old with a Facebook account, not with a major corporation’s marketing strategy. Yes, yes, I went on to explain the effect that blogs have in terms of Google rankings; the algorithms reward getting a steady stream of fresh, keyworded information onto a business website. And pretty soon she came around to embrace the concept to the point where she wanted to discuss topics for the blog posts. I’m still an advocate of blogging for small business sites where a personal tone, or the owner’s identity, is key to branding. That sort of writing is, in fact, quite close to what we think of as traditional blogging. But, quite frankly, the concept of the corporate blogs has always been awkward. Most CEOs and marketing directors are too busy to blog consistantly, so the posts are either ghost-written under their names or, weirdly, anonymous. A corporate newsfeed, written by a team and edited by a communications professional (yes, that would be me), is quite a bit more honest and direct. And, to come full circle, isn’t that what blogging is all about? Sounds familiar. Write in a few months and share if you see a shift in perceptions with the new term. And would you publish your corporate newsfeed on your corporate site on or a blog? 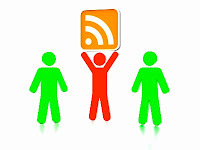 Of just using the orange rss-icon?